When was the last time you brought in a cleaning company to deep clean your carpets? Vacuuming can only do so much, and the bottom of your carpet traps pet dander, cigarette smoke, dust, and other nasty things that aren’t good for your indoor air quality. There are several different techniques and types of equipment available for professional cleaning companies. The most common methods are shampooing, dry cleaning, and forced hot water extraction. 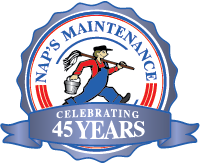 At Nap’s Maintenance Service, we’ve evaluated the effectiveness, environmental impact, and safety of all of our different options, and we chose hot water extraction. Forced hot water extraction is sometimes referred to as “steam cleaning,” but there isn’t any steam involved. Water and a cleaning solution are heated to temperatures of around 122-248 degrees Fahrenheit, using special truck-mounted equipment. 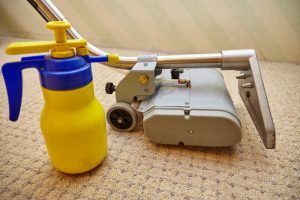 After the surface of the carpet is treated with an alkaline cleaning solution and lightly agitated with a brush, we pass the cleaning tool over the carpet several times to thoroughly rinse out the preconditioner. The surface is then thoroughly dried, preventing moisture damage to the wood or plywood below. Here’s why we use forced hot water extraction for thorough carpet cleaning. It’s recommended by manufacturers. The majority of carpet manufacturers recommend hot water extraction for cleaning their products, and this method is safe for nearly all carpets we come across in people’s homes. It provides a deeper clean. Shampooing and dry cleaning come up short, providing only superficial cleaning. Hot water extraction cleans deeply, removing even stubborn stains and odors. Minimal residue. Shampoos, powders, and dry cleaning solutions can leave residues that are tough to get out completely. When done professionally, hot water extraction does not leave residue. It’s environmentally friendly and safe. Environmental concerns are important to us, and one of the reasons that we prefer hot water extraction is that it’s eco-friendly and safe. It doesn’t rely on any harsh chemicals, which can pose a risk for children and pets. Instead, it uses gentler solutions, which are also less environmentally damaging to manufacture. Yearly professional carpet cleaning with hot water extraction gets out dirt and discoloration that vacuuming can’t, leaving your carpets spotless and free of dust and stains. At Nap’s Maintenance Service, we’re always available to talk to you about your options for thorough, effective home carpet cleaning. To find out more, or to schedule your next cleaning, call us any time at 508-226-4492.